It’s been a while since I’ve written about doing anything “out and about” in Bahrain. Summer hits and it’s too damn hot to even want to do anything. Thankfully, the weather is now beginning to break! Days are still hot, but more bearable. The evenings though – they’re becoming the perfect. This past Monday evening, we capitalised on Anish’s day off and headed off for the evening to see some cars. Yes, cars. This is a shared passion. Well, not really a passion for me, but big interest. BIG. Thanks to my brother and dad most likely. Dad liked his cars, and racing in general. My brother’s always been into them too. And somewhere along the lines that permeated into me. Ahhh – it’s the smell of burning tyres in the air. This guy was one impressive drifter. Hard to see the track through the smoke at times. 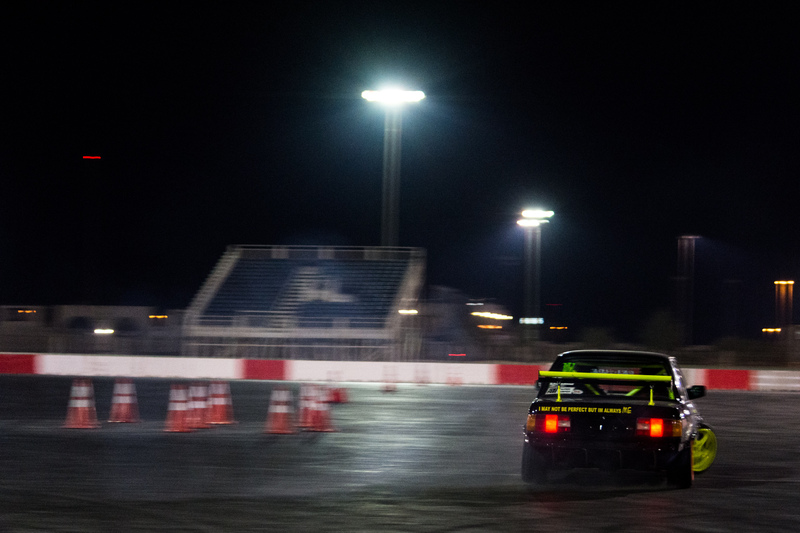 On Monday night the Bahrain International Circuit were holding a Drag and Drift night. Come with your car, pay a little bit and you get to drag race, drift or both. No, we weren’t participating. Just enjoying the action. For BHD 2 per ticket, that’s not a bad way to spend a few hours in the evening. And I get to practice my photography a little bit more. Win-win. Burning rubber like a mad man. Just look at this car. It’s hard not to. The drifting was fun to watch. Especially being so close to the action. I did wonder about the health and safety aspect of that. For a short amount of time. The very big Sakhir Tower. My one successful panning shot of the night, while watching the drag racing. Who’d have thought I’d have been able to catch a teeny tiny biker in a panning shot from where I stood? The drift action mostly consisted of some inability to drift, cones getting stuck under cars and in tyre wells, and some decent drift action. Taking photos was challenging. I think I gave up taking photos of the drag racing. Panning is hard! It really is about getting your stance right and tracking your target. The drag racing was great fun to photograph. Still challenging, but the cars are a lot easier to track. And there was a bit more drama to capture. Wow! That last shot is incredible!! Good job! Major top marks for that panning shot! The shot of the Sakhir Tower is also beautifully captured. Thank you Jina! We were really close to the drifting. All that separated us was a waist high, 1 metre-ish thick, concrete barrier. When the cars came flying by you did almost feel like you should take a step back just in case. But it was fun to watch. There are so many different types of car racing event type things, honestly think there’s something for everyone. Maybe that’s just the car fan in me. Very very. Me and a friend, fellow female, were counting other fellow females there. I think there were 2 others. You got close to that car! Or maybe it’s the zoom on your camera. That last shot is great. There’s a documentary I enjoyed called Closer to the Edge (2011), which is about the dangerous motorcycle race on the Isle of Man. You get to hear what makes these guys tick and the races are suspenseful. It’s even on youtube I think. Has a 100% fresh rating on Rotten Tomatoes. The cars got CLOSE. So there was a concrete barrier, about waist high on me (I’m 5ft2) and the barrier was about a metre thick. Maybe less. And then there was the drift track. So… CLOSE. That is a great documentary – Remember watching it and being floored by these guys mentality. So driven. And slightly egotistical. But I guess you have to be to do what these guys do. Holy heck, you did a gorgeous job, my friend, and I can hear the excitement pour from your words! Fab! Thank you, Tori – you’re too kind! What great practice! Is the last photograph cropped on your blog? Or was the cyclist just out of frame? If there’s more to it, I’d love to see. The background streaks are perfect. You know what, it is cropped ever so slightly – good spot! Here’s the original – http://i.imgur.com/Fa1uirz.jpg – The biker just looked so small, hence the cropping. Maybe I should have left it uncropped? I think it’s my browser. I see the whole photo for a split second and then half of the biker is cropped out. Nevertheless, LOVE LOVE LOVE the full photo! The biker is not small at all. The lines are soooooo good. So good! The biker is also crisp. NICE. Oh how bizarre, would you mind sending me a screenshot – it might be something I can fix! Thanks for the critique and feedback Lisa! I think that’s something I miss from my photography. Hmm, i will investigate! Thanks, Lisa. Yep, that final shot. In-freaking-credible.